Zodiac – Did You See That One? Robert Graysmith (Gyllenhaal) gets sucked into the case of the Zodiac killer while working as a newspaper cartoonist. His interest becomes obsession as he digs deeper into circumstances surrounding the mysterious killer. This film is a dramatized account of the experiences Robert Graysmith (Auto Focus) had while working to identify the Zodiac killer. Graysmith wrote his own account of his experiences in his 1986 book, Zodiac. This book was adapted for the film by screenwriter James Vanderbilt (The Amazing Spider-Man). The film was directed by Oscar nominee David Fincher (Gone Girl). The cast includes Jake Gyllenhaal (Nightcrawler), Robert Downey Jr. (The Judge), Mark Ruffalo (Foxcatcher), and Anthony Edwards (The Client). This story pulls from the real events surrounding the rise and disappearance of the serial murderer known as the Zodiac killer. The rest if filled in with the workings of a Hollywood mystery film. The result is a movie that is riveting in moments and somewhat slow in others. 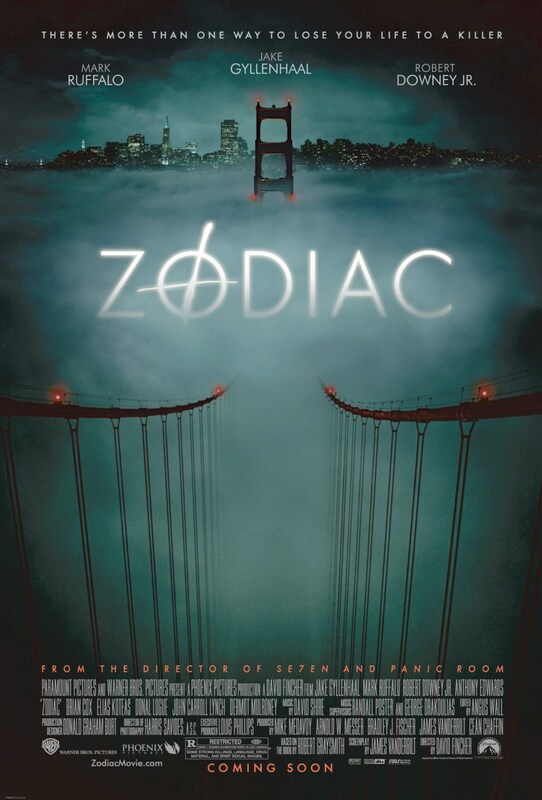 One of the strengths of the film is the depiction of the crimes and the unique circumstances surrounding the way the Zodiac announced himself to the world through the press. These two aspects create some of the more gritty and disturbing aspects of the film. The characters are also nicely created through a number of good opening scenes. These characters all have important roles in the story that spans a number of years. Unfortunately the span of time and the number of characters introduced also hurts this one. The movie often feels like a mini-series that was cut down into a feature film. The later introduction of some characters seems to slow the pace of the film as well. Unfortunately, this one seems to fall victim to the desire to stay close to the real story. The procedural side of the case overwhelms the action and really makes portions of the film come almost to a slow crawl. While the overall arc of the story holds up, this one seems to be working too hard to find the smaller and less important details on its way to a conclusion. The acting in this one is really solid. Jake Gyllenhaal really leads the way with a performance that is both innocent and dangerously curious. He brings out the borderline obsession of his character through a number of great scenes. He also has good chemistry with the other cast members. Robert Downey Jr. is one of the other highlights in this one. He does a nice job with a role that fits right in his wheelhouse. As with the rest of the cast, these two were able to bring life to a rather slow screenplay. Mark Ruffalo is another nice addition to the cast. Like the other stars, he was able to work with the changes in his character over the period of time being depicted. His role also called for a very strong emotional performance, which he delivers. The cast is large, and features a number of recognizable faces. Anthony Edwards does nice work in his supporting role. Overall, this cast made good use of flawed writing and elevated it to something solid. Despite the slower moments in the film, this one has acting that makes it worth checking out. This film makes the decision to be brutal in portraying the crimes of the Zodiac killer. This pays off in setting the tone of the film and sparking the action throughout. The cinematography by Harris Savides (Birth) really captures the tone of the story. He’s aided by great set design and art direction work. The movie also features an excellent score by David Shire (Saturday Night Fever). Like the visuals, the music captures the tone and brings things to life. This is a good movie that misses being great due to the scope of the story. While there are a number of great moments in the film, there is just too much time spent on the minutia of the case. This has some intensely violent moments that really accentuate the brutality of the Zodiac killer. If you’re a fan of crime thrillers or films based on true stories this is one for you. I would also suggest this one to fans of any of the stars. I give this one 3.3 out of 5 stars.